I sprained my ankle on the last day of ANWG, alas – wasn’t looking where I was going, stepped on my foot the wrong way, and went down pretty hard. It stopped hurting after a few minutes, so I thought it was OK, but I took off my socks that evening to find a golf-ball-sized lump on my right ankle. Fortunately, the friend I was staying with is an ER surgeon, and she diagnosed it as “a classic ankle sprain,” iced me up, and wrapped an Ace bandage on it the following morning to get me through a day of traveling home. It’s better now, but it’s put quite a crimp in my work the last few days, as walking has been difficult. I’m just glad it wasn’t worse! 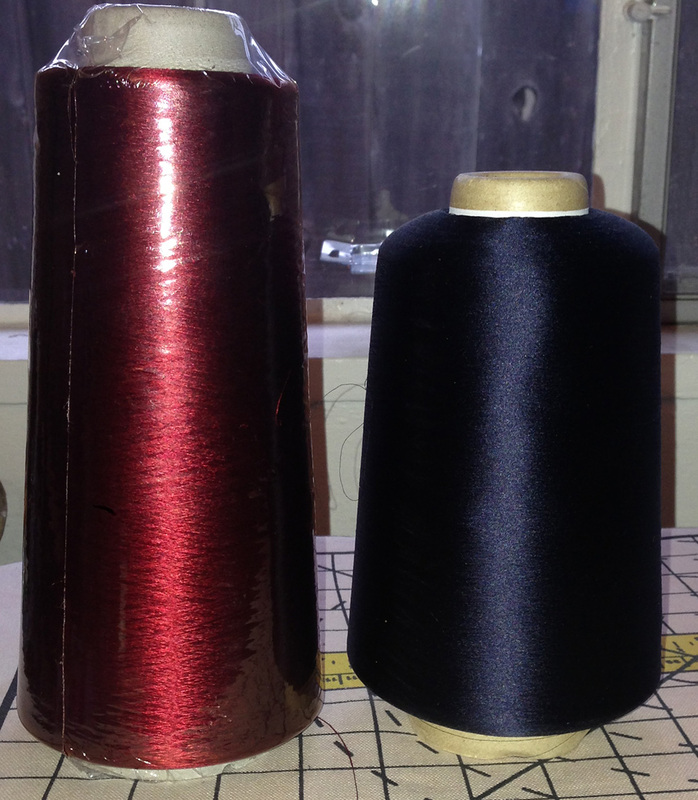 On the left is a ruby red tram silk from Lunatic Fringe, 6 strands of 20-22 denier reeled silk, which clocks in at about 30,000 yards per pound. There are 15 ounces of yarn on the cone, and a little math gives 15 miles of yarn on that one cone. Anyway, I’m not sure how fine the yarn actually is. Looking at it, I’d be shocked if it were more than half the weight of 120/2 silk, so being conservative, let’s say it’s 60,000 yards per pound. Then this cone, with 400 grams of silk, contains at least 30 miles of yarn! So, very fine yarn indeed. What am I planning to do with this? 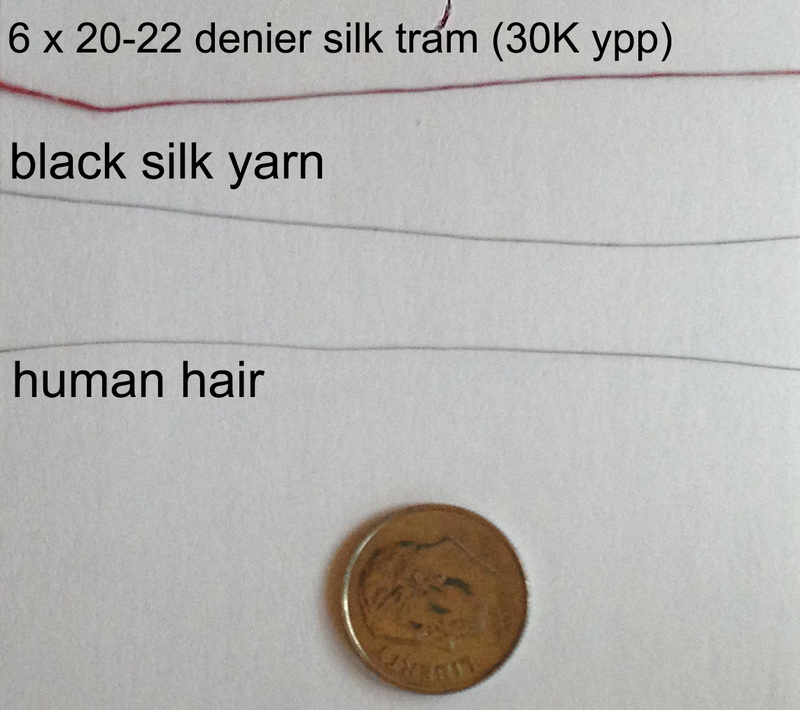 I want to try collapse weave, 1/3 vs. 3/1 twill pleats in a very fine silk yarn – 140/2 silk yarn, to be precise. To accomplish this, you need a weft yarn that’s much finer than the warp. But if the warp is 140/2 silk at 30,000 yards per pound, how do you find a thinner weft? Well, here it is! This will do very nicely. I’m not quite sure when I’ll get a chance to weave it up, as my ankle sprain more or less precludes weaving, but hoping to do it fairly soon. Other than that, life has been fairly boring the last few days – mostly catching up on sleep, spending time with Mike, and staying off my feet as much as possible. I hope this ankle heals up quickly!